Who are you? I mean, really! That’s the point of today’s interview with Bev Weidner of the site Bev Cooks. Finding your authentic voice through writing, photography, captions and more can be such an important part of a food blogger’s existence. So that’s the focus of my interview with Bev. Well, that and the twins. You know, we can’t forget the twins! Today is such a great day because I get to share with you my conversation with Bev Weidner. You may know Bev best because of her site BevCooks. But then again, her wildly popular Instagram account may have a little to do with it too. When you think of Bev, the word quirky comes to mind, but I promise it’s quirky in the best way possible. She walks to the step of her own drummer. That’s authenticity at its best! The question is, how can you be yourself when you’re bombarded with messages trying to manipulate who you are all day long? Even from birth we’re taught in a way that best reflects what others and society wants. Be a good girl. Boys don’t cry. You know what I’m talking about? How can a person really know her or himself? Bev and I talk about these heady issues, but in a lighthearted and downright fun way. The answer to how to be authentic? Here’s what I’ve landed on. You won’t know it overnight. It requires tasting a thousand cookies before knowing the one that really rocks your socks. Then repeat that with fruit, and vegetables, and purses (I think I’m on 1,001 purses), and writing styles. In other words, you have to get yourself out there and take the time to be reflective. See how you react to these things. That’s when you start to really know yourself. Journaling helps. And if you’re into journaling, you’ll love next week’s podcast interview too! See below for the 411 on our next guest! The twins’ musical ability. Let’s just say Natalie better pick it up a notch! How bloggers can deal with online bullying. Yes, it happens. How to capture those brilliant thoughts that come to mind when shooting a cookie, but somehow disappear when you sit down at the computer! 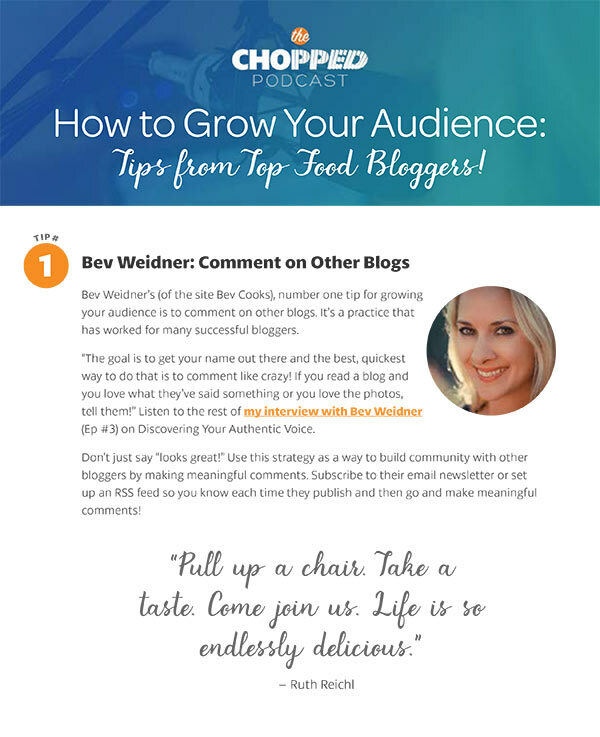 Learn more about today’s guest, Bev Weidner on her site, BevCooks. Bev mentioned this VSCO – you can join the fun too! Why not give Bev a shout-out on Twitter or Instagram and say thanks for the Chopped Podcast interview! Why not give Bev a shout-out on Twitter or Instagram and say thanks for the Chopped Podcast interview. The next episode of Chopped Podcast will feature an interview with Kristen Doyle Dine & Dish. Kristen and I talk about her harrowing experience last year that led to a very valuable aha! moment. We talk about that and Kristen’s pursuit for Balance and Happiness as a Food Blogger. Subscribe to the podcast to be sure you don’t miss it!